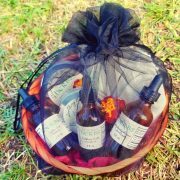 This basket it for a woman who is planning a natural home birth. The basket includes a 2 fl. oz. After Aid tincture, a 2 fl. oz. Shepherds Purse tincture, a 2 fl. oz. Mama’s Milk tincture, a 4 fl. oz. stretch mark cream, a 4 fl. oz. soothing nursing balm, a cooling muscle rub roll on, and 4 soothing herbal sitz baths. Shepherds Purse: For headache, and to stop post-partum hemorrhage. 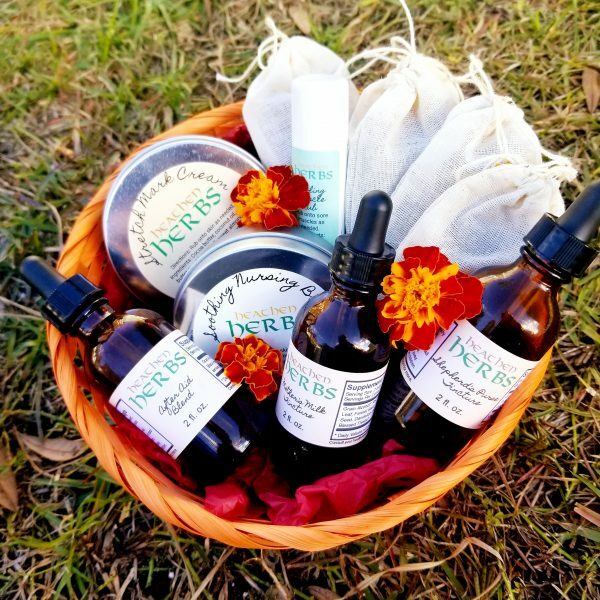 After Aid: Our after aid tincture contains a proprietary blend of Cramp bark, Black Haw bark, Yarrow aerials, and Motherwort aerials which help soothe after birth pains. Mother’s Milk: Galactagogues have been used for centuries to help increase the milk supply of nursing mothers. Our herbal blend also delivers vital nutrients to the nursing mother to keep her rejuvenated and balanced. 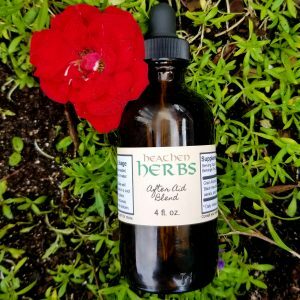 Our herbal blend includes dandelion leaf, blessed thistle, fennel seed, fenugreek seed, and red raspberry leaf. 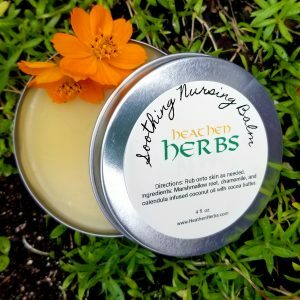 Soothing Nursing Balm: Our soothing nursing balm is lanolin free and contains Marshmallow root, Chamomile, and Calendula infused coconut oil, mixed with cocoa butter. It contains no essential oils but has a natural floral smell from the infused oils. Stretch Mark Cream: This stretch mark cream contains: Shea butter, Cocoa butter, Vitamin E oil, Rose Hip seed oil, Sweet Almond oil, Lavender, Geranium, and Frankincense essential oil. Cooling Muscle Salve Roll On: This cooling muscle salve for sore muscles contains Coconut oil, Cocoa butter, organic beeswax pastilles, Menthol crystals, Peppermint, Eucalyptus, Camphor, and Tea Tree essential oil. 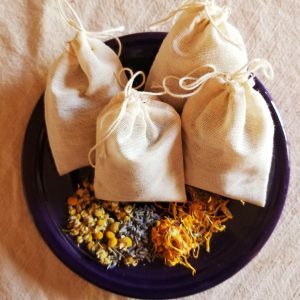 Soothing Herbal Sitz Baths: Our sitz baths contain Comfrey leaf, Witch hazel bark, Chamomile flowers, Calendula flowers, Lavender flowers, and Arnica flowers. The pack comes with 4 filled sitz baths in re-usable bags. Comes in a brown basket with colored tissue paper, with to/from tag and black organza bag.